July c'est Hot, Hot, Hot! Eli Paperboy Reed, Devotcka, My Morning Jacket, My Bloody Valentine and More!! Orchestra indeed—they’re making Franklin Roosevelt proud. Their pscyh-tinged chamber pop has hints of Sparklehorse and My Morning Jacket (who will arrive in Paris on Delano’s heels next week). Delano plays with the talented Candian-American folk-pop singer Martha Wainwright, part of the impressive musical family that includes her brother Rufus and father Loudon. The punky fast repitition of single notes reminiscent of the Strokes combined with syncopated rhythms of Forward Russia! or Ted Leo (and vocals that remind one more of the Wombats Matthew Murphy were he transplanted into the Buzzcocks) have earned this Leeds five-piece a loyal following from England to Japan. This will be one of those bands that moves on to an impersonal giant venue on their next trip to Paris, so if you like the feeling of a concert at your garden party, giddy-up. This is great T-Rex-influenced power pop. Witness their hommage in "Solid Gold Easy Action," an absolutely fabulous accelerated reprise of their forebears which appears on the Hot Fuzz soundtrack. On the other hand, they are versatile and sometimes pull off a low-gear twanger like "Ole Black'n Blue Eyes." This show will rock. Mark my words and thank me later. That's right, friends and neighbors, aging hipsters and rockers, indie Vespa honeys, nudists, and commies. Parisnormale and Gogoparis.com's DJay Indie Eclectique is back for another month of thursday-night indie fun at the fabulous bar L'Orange Mecanique in sunny Oberkampf/Menilmontant. DJay Indie Eclectique (DIE!) spins the foundational tracks of and the best contemporary indie rock, -pop, synth-pop, soul and garage. The exact address is 72 J.P. Timbaud, just off rue St. Maur, a couple of blocks from either Metro Parmentier or Metro St. Maur. From 9pm to 1:30am. Come hear live all the good stuff we discuss on this blog and a whole lot more--foundations of/and contemporary indie rock, that sprawling jenesaisquoi genre. France Gall to Of Montreal. Johnny Cash and Jerry Lee Lewis, to the Clash and the Fratellis, Wanda Jackson to the Klaxons. Good, cheap drinks (2,50 demis, 5 euros pints, + Happy hour prices). Djay Indie Eclectique will lead you in The LOCOMOTION, and his adoring dancing nudist colony will be proselytizing you to your, um, heart's content. Enjoy the flyers, spread the word, and mark your calendars. Get there early if you want a seat. These guys are getting a lot of love from the critics. I've tried listening to them, and honestly, I find it unremarkable saccharine pop. But let me give others the benefit of the doubt. Maybe it will just take a few hundred listens before I come around. I'll be missing this one, but those of you who are fans, knock yourselves out. I used to be ready to start hating Beck. He’s huge, so the get-huge-start-sucking syndrome would surely arrive any day. Now I’ve become a Beck-lifer. Clearly one of the most talented songwriters and performers of our age. He will be pushing his first album in two years, “Modern Guilt,” which promises to return to his quirk folk, laced with electro-guile. It’s a pretty penny this ticket, but I dare say he’s worth it: the dude can boogie. (And what are you going to tell your kids you saw back in the day? There'll never be another Woodstock, but we've got Beck). A very special set of shows will grace the Maroquinerie this week when the celebrated Swedish singer/composer/musician/director PVP provides an exclusively Parisian avant-premiere of his forthcoming album May, due out in autumn 2008. Von Poehl has collaborated with a number of other highly regarded artists such as Florian Horwath, Michel Houllebeq and Vincent Delerme. His acoustic and vocal style summons the ghosts of Nick Drake and Elliot Smith while paying homage to the early Paul Simon and Gordon Lightfoot, the living and the dead. Who said Paris’s music scene stopped in July? 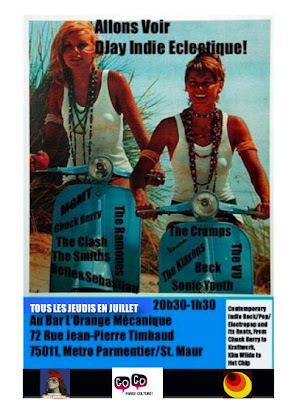 6-10 July, La Maroquinerie, 19h30, 20euros. Louisville, KY has for many years now had the indie power to thumb its noses at the ironically provincial coastal types with their caricatures of every other American region, not least of which is the South. Louisville boasts the arguable cradle of math rock (Slint), an outpost of alt.country (Freakwater) and the throne of gothic indie folk with Palace and Will Oldham's other projects (such as Bonnie Prince Billy). These bands are revered by a global cognescenti. And now there's the fabulously textured compositions of My Morning Jacket. They feature songs that build in tempo and volume, over well-wrought-lyrics and wailing vocal crescendoes, occasionally rocking out with a rumor of twangy country guitar. Easily one of my favorite bands these days. Well, this beautifully noisy act was as name-droppable as Pavement and Sonic Youth in indie rock circles of the 90s. Do they hold up? Have they reached their Zenith or should they rename the club Nadir? Only one way to find out. What a shame that it overlaps with another great "My" band previewed just above. The Whigs are famed for putting a twist on garage (as a band like the Detroit Cobras did by melding it with motown--or returning it to its R&B roots in Wanda Jackson and Co.). These Athens, GA fellas give you a kind of nuanced rootsy My Morning Jacket and inject it with grittier vocals and more reverb. They follow such numbers with a kind of driving Ramones pop punk slightly funked up. Clearly other songs are highly influenced by the Strokes and the latter's influences, such as Television and the Gang of Four. But again, it's grittier vocals and noisier guitars. Somehow this is one baby step for garagey indie rock and one giant step for...? Devotchka’s brand of quirky indie pop-rock (a kind of more “world music” version of Neutral Milk Hotel) first caught the attention of a broad but niche global public on the soundtrack to the cult film Little Miss Sunshine. These Americans combine brass, violins, and Theremins (among other pieces that make one wonder if they just robbed a musical instruments dealer) with more typical rock instruments to produce a signature sound somewhere between a haunted house soundtrack and a gypsy wedding. Also playing: TV BUddhas and Boogers. Two Melbourneans formerly of Black Poney Express and the Drones, respectively. Punk, Punk wavers, and power pop. Good lordy! Is this some 90-year old Motown relic? Au contraire, the 24-year old “paperboy’s” Martin-Gaye delivery is part of the retro-soul mouvement whose most visible icon has been Amy Winehouse. But that may be changing. The air is buzzing with talk about global music awards. What a treat to see EPR in such an intimate setting. Dancing Punk Rock from the U.S. The great soul-folk troubadour growls and moans his way into the City of Lights for two big nights. Currently sold out, but try Craig's List and Les Inrocks forum for scalpers. Don't miss a brand-spankin new playlist this Friday night, June 27. Even better, guest dj Chazmaniac will be donning his leopard -skin thong/string and dancing on the bar, while djay Indie Eclectic serves him tequila shots. Look for music from the Brian Jonestown Massacre, Hasil Adkins, MC5, Kimya Dawson, Of Montreal, and many many others. 2.50 euro demis, 5euro pints. Listen now, thank me later. Brian Jonestown Massacre July 3! The Fabulous Brian Jonestown Massacre will play the Bataclan July 3. 9. Apocalypse Meow, You say Party! We say Die! 18. Americans Abroad, Against Me! In addition to the following I recommend checking out La Feline (75018 and see our sidebar), which is celebrating its 2-year anniversary. 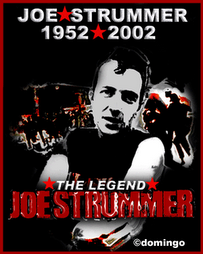 Great rockabilly, garage, punk. For fans of Iron and Wine, Mazzy Star et the VU. It's Thursday! 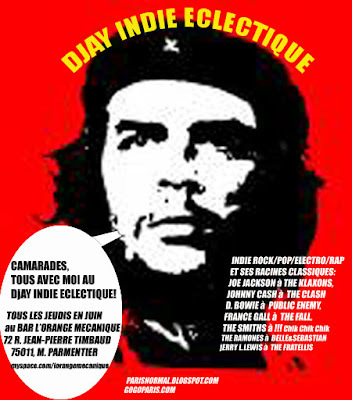 Djay Indie Eclectique! That's right, friends and neighbors, aging hipsters and rockers, indie Vespa honeys, nudists, and commies. Parisnormale and Gogoparis.com's DJay Indie Eclectique is going to be spinnin' yous round tonight, Thursday (and next Thur too) at the fabulous bar L'Orange Mecanique in sunny Oberkampf/Menilmontant (plus Friday night June 27). Tonight Gogoparis.com critic Channa joins him! Get ready for an updated set list of just released stuff and some new-old gems! The exact address is 72 J.P. Timbaud, just off rue St. Maur, a couple of blocks from either Metro Parmentier or Metro St. Maur. From 9pm to 1:30am. Come hear live all the good stuff we discuss on this blog and a whole lot more--foundations of/and contemporary indie rock, that sprawling jenesaisquoi genre.France Gall to Of Montreal. Johnny Cash and Jerry Lee Lewis, to the Clash and the Fratellis. Good, cheap drinks (2,50 demis, 5 euros pints, + Happy hour prices). Enjoy the flyers, spread the word, and mark your calendars.Get there early if you want a seat. Why not see Bombazine Black at 9 and then head to Djay Indie Eclectique at Orange Mecanique until 1h45am? guitar, bass, cello and vibraphone. It should be a really great show. small cover charge. Tell your friends and enemies. That's right, friends and neighbors, aging hipsters and rockers, indie Vespa honeys, nudists, and commies. Parisnormale and Gogoparis.com's DJay Indie Eclectique is going to be spinnin' yous round tonight, Thursday (and next Thur too) at the fabulous bar L'Orange Mecanique in sunny Oberkampf/Menilmontant (plus Friday night June 27). The exact address is 72 J.P. Timbaud, just off rue St. Maur, a couple of blocks from either Metro Parmentier or Metro St. Maur. From 9pm to 1:30am. Come hear live all the good stuff we discuss on this blog and a whole lot more--foundations of/and contemporary indie rock, that sprawling jenesaisquoi genre.France Gall to Of Montreal. Johnny Cash and Jerry Lee Lewis, to the Clash and the Fratellis. Good, cheap drinks (2,50 demis, 5 euros pints, + Happy hour prices). Enjoy the flyers, spread the word, and mark your calendars.Get there early if you want a seat. at Studio de l'Ermitage (8 rue de l'Ermitage, Paris 20ème, métro Ménilmontant). Tuesday, June 10. Webley's great indie folk incorporates sweet songwriting, accordion, acoustic g, viola. Narrow Terrence incorporate Tom Waits-like vocals with a polyinstrumental cast reminiscent of Calexico. This promises to be an interesting night: artists that use toys as instruments. 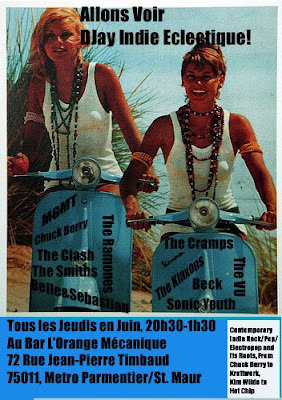 Reminder/Rappel: DJay Indie Eclectique Tonight!